DP World handled 71.4 million TEU across its global portfolio of container terminals in the full year of 2018. 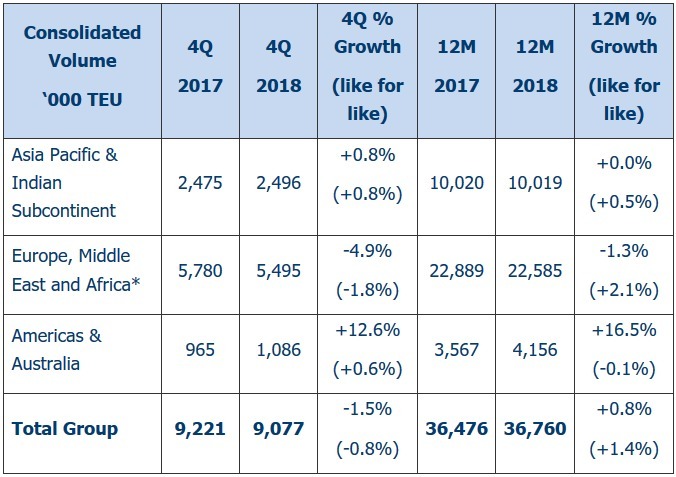 DP World handled 71.4 million TEU (twenty-foot equivalent units) across its global portfolio of container terminals in the full year of 2018, with gross container volumes growing by 1.9% year-on-year on a reported basis and 2.9% on a like-for-like basis Gross volumes were stable in 4Q2018 despite softer volumes in the UAE and the tough year-on-year comparables (4Q2017 grew by 10.3%). 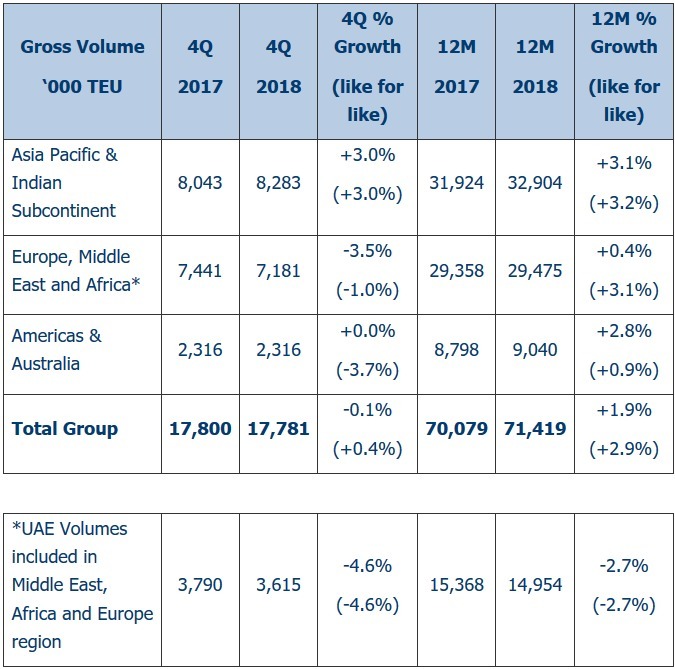 The UAE handled 15.0 million TEU in 2018 down 2.7% year-on-year. At a consolidated level, our terminals handled 36.8 million TEU in 2018, a 0.8% improvement in performance on a reported basis and up 1.4% year-on-year on a like-for-like basis. Group Chairman and Chief Executive Officer Sultan Ahmed Bin Sulayem commented: “We are pleased to see that our global portfolio has delivered growth on top of our strong prior year performance and despite the uncertainty with global trade. Our Europe and Americas portfolio saw strong growth with continued ramp-up in London Gateway (UK), Yarimca (Turkey) and Prince Rupert (Canada), while performance in Africa remains robust driven by Dakar (Senegal) and Sokhna (Egypt). In the UAE, the softer volumes were due to the loss of low-margin throughput, where we remain focused on high margin cargo and maintaining profitability.